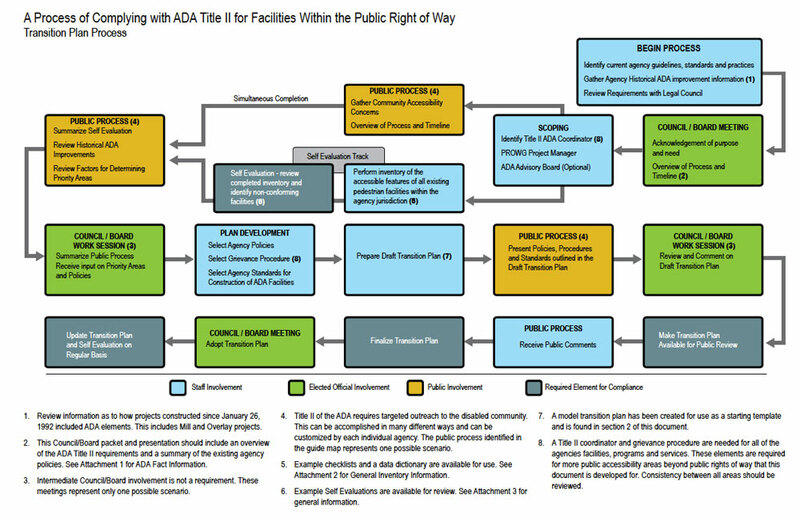 This guide outlines the process for Minnesota public agencies to develop an Americans with Disabilities Act (ADA) Transition Plan for public rights of way. It supplements a toolkit developed by the Department of Justice to help local governments comply with Title II Public Rights of Way aspect of the American’s with Disabilities Act (ADA) Requirements set forth in the Code of Federal Regulations (C.F.R.). Each agency has been required to evaluate its services, policies and practices and the effects thereof that do not meet the requirements set forth in the ADA. For any structural changes to facilities outlined in that evaluation that are needed to achieve program accessibility, a transition plan is required to be developed. While this guidebook only relates to an agency’s public rights of way, many sections of the document need to be closely coordinated with any other transition plans the agency may have to provide seamless procedures and service. Important: Obtain legal counsel regarding the advisability of using information in this document or in its attachments. Contact: MnDOT Research Services – research.dot@state.mn.us or 651-366-3780. This online guide offers step-by-step guidance for Minnesota local agencies to develop an Americans with Disabilities Act (ADA) Transition Plan for public rights of way. Model Transition Plan Template – This document is intended for local agencies to use as a base in developing their own transition plan. It is provided as a Word document so you can edit the text to best for your agency. The highlighted text within the document is intended for you to update with your county specific data. Transition Plan Commentary – This document provides commentary for each of the sections in the Model Transition Plan Template listed above. It is intended to be referenced when using the template, so that the user understands what information is necessary for each section and why. Policies and practices – Detailed description of the methods to remove these barriers and make the facilities accessible. Identification of the standards to be followed. MnDOT – Information on what MnDOT is doing to make transportation accessible to everyone. Great Lakes ADA Center – Resource to increase awareness and knowledge of ADA compliance. United States Access Board – A Federal Agency Committed to Accessible Design. Accessible Pedestrian Signals – A Guide to Best Practices. Accessibility Online – free webinars and audio conferences on accessibility topics.